The inside port ‘Mar Piccolo’ of Taranto after the raid by Swordfish torpedo bombers from carrier Illustrious. From the two damaged cruisers on the left petrol is running out. Mediterranean: THE TARANTO RAID (Operation Judgement): 21 Swordfish torpedo-biplanes (2 lost) from carrier Illustrious carry out surprise torpedo/bomb attack on Italian Fleet in Taranto naval base. 3 battleships hit – Conte di Cavour sunk, Caio Duilio and new Littorio damaged (night November 11-12). Italian Fleet subsequently leaves Taranto for Naples and Genoa. Cruisers Ajax, Orion and Sydney destroy Italian convoy in Strait of Otranto; 4 transports sunk (night November 11-12). Two large formations of fighter-bombers attempt to reach London; a few aircraft drop bombs in three London districts. Ju 87 Stukas make unsuccessful raid on convoy off Kent. 50-strong Italian formation defeated off Suffolk coast by 2 Hawker Hurricane squadrons. British losses, nil; Italian losses, 6. Short night raid on London (20 aircraft). 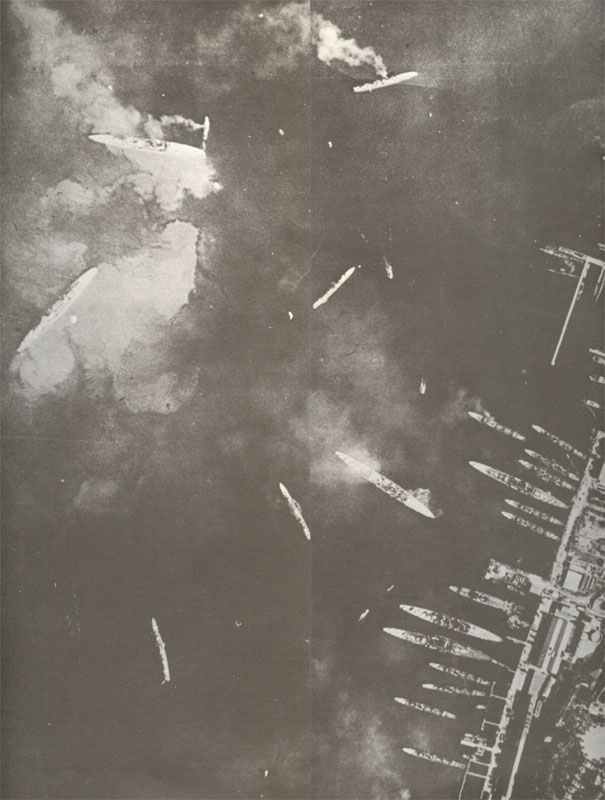 RAF night raids on Italian supply ports of Valona and Durazzo (Albania). USA: First Jeep delivered to US Army.